The Brassia Orchid, or Spider Orchid, is another great genus of the Orchid family. They produce medium-sized spectacular flowers that resemble spiders. In the wild, this attracts spider-killing wasps, a method of spreading pollen from one plant to another. The plant itself takes up a large amount of space with its sprawling spikes and flowers. A single plant will typically have up to 20 blooms at a time in a wide variety of colors. With the introduction of hybrid versions, you can find this flower in cream, brown, red, spotted yellow, or green. The Spider Orchid blooms from spring to summer naturally, but there have been reports of them blooming in the winter indoors. With the right growing conditions, you can force any Orchid to bloom any time you want. Known for the intense scent that they give off while in bloom, these Orchids are a real attention-grabber; they will fill a room with a very distinct aroma in no time after the blooms open. 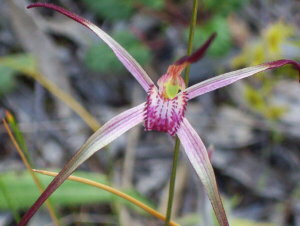 Your Spider Orchid is relatively easy to care for in relation to other Orchids. Follow our care guide below and you should have no problem at all. 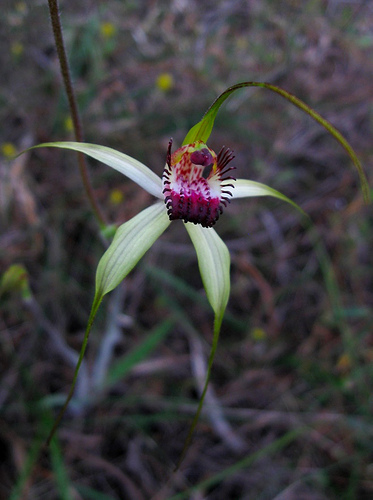 The Spider Orchid prefers low light levels when not in bloom. A shady place that gets a small amount of indirect sunlight during the day is perfect. When it’s ready to bloom, give it plenty of indirect sunlight to replicate the increase in sun during the spring. You will need to water this plant thoroughly, flushing the excess salts out in the process. The amount of time between watering can vary greatly depending on what you are using as a growing medium and how warm the spot is. Allow the growing medium to almost completely dry out before watering your Spider Orchid again. This Orchid needs high levels of humidity if you want it to thrive. You will want to stay between 60% and 70% all day for best results. It might be a good idea to place the potin a tray of pebbles with water so that the water can slowly evaporate. The Spider Orchid is natural to Central America, so it needs tropical temperatures year round. They like to be around 65 degrees during the day and drop down to 60 degrees at night. Anywhere around this will work fine. – Repot your Spider Orchid every couple of years, when you notice the growing medium starting to break down. When the growing medium starts to fall apart, it holds too much water and can cause rot problems. Find a pot that is only slightly larger than the one you are using. Orchids do not like to expand like most other pots because they are not naturally designed to live in dirt. – Let your Orchid rest for a few weeks after they are finished blooming. Put them in an area with slightly cooler temperatures and lower light for 6 – 8 weeks. This gives them time to rest and get ready to start growing again. – Take note of anything different that you find on the instructions that come with your plant. Hybrid species can have additional care requirements that you may have to take into consideration. – Pick up your watering routine a little while they are in bloom so that the flowers last longer. Your Spider Orchid will appreciate more water to help keep them hydrated while they are hard at work. How long do Orchids Live Growing Indoors? What is the King of Flowers?